Consider it official. After a lot of speculation, the Chinese Basketball Association will once again change its rules about the participation of foreign players in the league as it looks to shift the league away from American hero ball and towards a style of play that will involve local players more often. Previously, teams were allowed to play both their foreigners for a combined six quarters, meaning each split a quarter in the first half and then play for the whole of the second. Under new proposals that will be applied with immediate effect, only one foreigner will be allowed to play for the fourth quarter. Both foreigners will be able to play but they will have to sub out for one-another.The reaction to this ruling among the league’s top teams has been immediate. 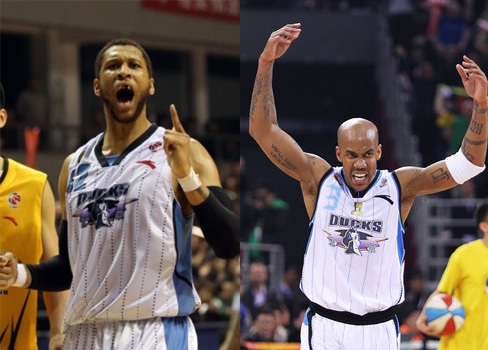 Beijing, the reigning champions and owners of the best duo of overseas players in Stephon Marbury and Randolph Morris, have called for a delay on its implementation. The cash-flush Xinjiang Tigers, who lost to Beijing in the finals last year, have began stockpiling Chinese free agents to stop others from improve their local rosters. The logic behind the rule change is simple; the foreign players are taking over the fourth quarter and the league wants to dial it back. Due to the current structure of the league, local players have been reduced to middle relievers who are expected to help their team maintain the lead but ultimately give way to the Americans to finish out the game. There is also a deeper concern, namely that the Chinese national team has began to regress from the golden age of Yao Ming, Wang Zhizhi and Mengke Bateer. Defeat in the 2013 FIBA Asian championship quarter finals to ‘little brother’ Taiwan was the start of the panic (one local newspaper called it ‘the darkest day in Chinese basketball history’). At the FIBA Asian Cup held this year on home soil, the Chinese U-23 team also suffered a shock defeat to sporting minnows India and then shipped another embarrassing defeat to Taiwan. China’s best showings at the international level coincided with the league’s previous era, when Chinese and American players were not too far apart in terms of quality. Back then, the national team roster was predominantly filled with players from Bayi and Guangdong, who won fifteen of the first sixteen CBA titles and had little to no foreign players taking away touches from the locals. The reduced opportunities Chinese players get in the CBA is now thought to be affecting the ability of the new generation of national team players and their ability to compete on the global stage. On paper, this will create more Chinese involvement in the games but there are still some issues. Firstly, teams who finished in the ‘deadpool slots’ (the bottom five from the previous season) and thus are allowed one further overseas ‘Asian’ import) will still get to keep their extra foreigner on the court along with their designated American. Secondly, the quarter restrictions do not restrict teams from playing both their foreigners in the third quarter and hope they can build up an insurmountable lead that their local players can defend for the final twelve minutes. Finally, there remains the possibility that CBA teams simply continue to look to Taiwan for additional talent rather than bring through young mainland players (the CCP government regards Taiwan as a renegade province rather than an independent country meaning that Taiwanese are classified as local rather than ‘foreign’ players). Moreover, the rule changes certainly don’t solve the CBA’s ideological crisis. The league loves having foreign players who can do things local players can’t, but also somehow wants Chinese players to get into the game more. If the league was truly committed to ensuring more local guys took big shots, they would restrict teams to one foreign player on each roster starting in 2015 or 2016. They still might but it would be unlikely. In the meantime, there is a vague, somewhat non-committal rule change that could be altered either way depending on what the league wants to do in the future. It seems then that the CBA will use this season as a trial period and if attendances don’t fall, the league may be tempted to further tinker with foreigner restrictions. Its difficult to say in what direction things will go but in the meantime, the new mandate will have huge effects on the upcoming CBA season. Instead of creating this new rule, which by the way sounds silly as the integrity of the game is compromised (although I do understand where they are coming from and why they are implementing this),I believe the CBA can gain insight from the structure of PBA (Philippine Basketball Association) games. The PBA hasa 3-tournament season. The first conference is simply for locals and is much longer (almost twice as long as the other two conferences). The second and third conferences allow imports, however, height limits are imposed; most recently, 6’9″ for the second conference and 6’5″ for the third. While this is not a permanent solution, or one that may not be too viable for the CBA, I believe that some sort of adaptation of this structure can benefit the CBA. Imagine a first mini-season/conference where only locals play; they can get valuable experience, training, conditioning and competition. For the second conference, you can introduce two imports, yes, but only one import can play at a time, perhaps spelling each other. In the PBA, more often than not, imports are recruited to play PF or C. If the CBA recruits players of a certain position, why not make it two of them, and then teams use the two imports to spell each other and to “restrict” their minutes.